What we do? ...We help people discover ..."What they be?" We are very fortunate to be living in a country where everyone has lots of freedom to believe & express their own spirituality. Within this spiritual community are many who are wonderfully gifted, talented, experienced and genuinely walk their talk. These are people who are very good at what they believe. Within this spiritual community are those seeking to discover truth; those who are inspired with curiosity to explore; those who simply enjoy the energy and commadrie being with like minded folks. 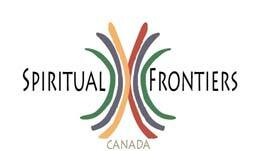 Spiritual Frontiers Canada's niche in the spiritual community is in bringing everyone together. We invite these wonderfully gifted people to give talks and facilitate 3-hour workshops to the spiritual community. Spiritual Frontiers Canada (SFC) is a not for profit organization and is managed and operated wholly by experienced volunteers. Oh, and by the way, we keep an open mind and make no judgements. We purposely do not endorse or disapprove of any of our guest speakers or any topic that is presented. We want to encourage diversity and be open to what comes. We encourage all who attend SFC events to accept and discern for themselves what is being presented and by whom. We provide a safe comfortable friendly environment to feel free to share, make and maintain friendships, while at the same time, provide an opportunity to learn, explore and broaden the mind with new spiritual insights & concepts. We attract the generosity of very gifted honourable speakers to give those talks and facilitate the workshops. Please view the Calendar and Past Presenters pages to see who will be coming and who we previously invited. We provide the talks for free and we ask only for a small fee for the workshops. We sometimes organize special events as well, which are either free or we ask for a minimal fee. For most of the free events, we welcome contributions to help cover costs and please know that contributing is optional and we welcome everyone. During most months, talks typically take place on the first Thursday evening of each month, with few exceptions being on a Friday evening. Workshops typically take place on the 3rd Saturday afternoon of each month, with the exception of July & August summer months, when no workshops are held. Spiritual Frontiers Canada provides a community table for participants and guest speakers to display pamphlets, business cards, event announcements or any other handouts. We ask that you kindly remove your materials before you leave after the event. We provide a wonderful place for you to be among a group of people who really appreciate you and what you have to share. By volunteering to give a 1.5 hour talk we hope you gain much from the experience and we certainly appreciate your sharing. When guest speakers facilitate workshops for SFC, we provide a modest honorarium and a modest percentage of the door when attendance exceeds a certain number of people. A well seasoned talented team of SFC volunteers do the event planning and implementation; including scheduling, room booking, room set up, provide audio/visual equipment; educate the community with published articles, advertisements and emails. We make it as easy as we can for our guest speakers and facilitators. SpiritualFrontiers.ca: Each event is given time on the home page until after the event is over. SpiritualFrontiers.ca - Calendar: Each event is posted in the calendar of events until after the event is over. Emails: SFC sends emails to a large list of people who regularly or occasionally attend the SFC events and requested to receive emails from the organization. Community Event Table: SFC provides a community table for participants and guest speakers to display pamphlets, business cards, event announcements or other handouts. Display Table: Do you have any books, spiritual and/or health goods? SFC can provide a table specially for displaying any of your published materials or goods related to your practice that you feel the community would be interested in receiving via in good spirits, money or other types of energy exchange. If so, please let us know in advance and we will let the community know via our educational efforts. Please Note: List items 1-4 will include the guest speaker's website if one exists. Please forward any questions or comments about this site to the webmaster.